There is one aspect of parenting that I feel more strongly about than most others, and I have no explanation for why. I want my sons to be close, best-friend, always-there-for-each-other, close. I want them to have the kind of intimacy that comes with having spent a lifetime together, and I desperately want it to last. But why I feel this so passionately, why it ranks right near the very top of the list of things I hope for my family, I would struggle to say. By the time a child is eleven, she has spent a third of her free time with her siblings, more time than is spent with any other person. Kluger also reminds us that the sibling relationship will be, for most of us, by some measure the longest relationship in our lives. Kluger concludes by saying that siblings socialize each other. My three children shared a single bedroom and bathroom. Everything they ever learned about taking turns, personal space and accommodating the needs and desires of others they learned from each other in those two rooms. Lest I paint an overly idyllic picture, everything they learned about biting, hitting, head locks, and getting in the last shot, be it verbal or physical, they also learned in their very own bedroom. I often feel that they prepared each other for the outside world, perhaps more so than I did. Kluger describes the relationship between himself and his three brothers as, “a loud, messy, brawling, loyal, loving, lasting unit.” And that sounds just about right to me. 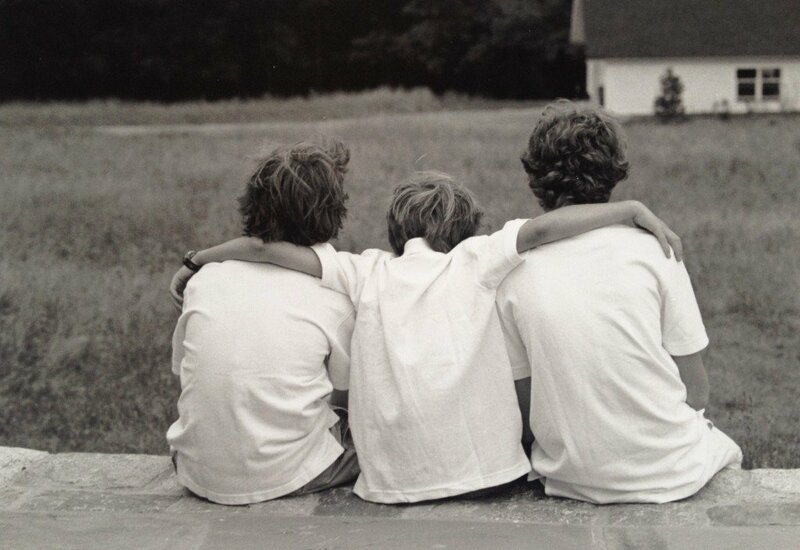 Could it be that I want my sons to be close because I believe that in no small measure they created each other? Psychologists call this deidentification but we parents know the phenomena as our kids working really hard not be like each other. How many families do we know where the younger siblings are less cautious either because they don’t want to emulate the oldest or because, as I suspect with my kids, they know whatever the problem, the oldest has got it covered. Siblings broaden our world by bringing their interests and friends right through our front door. If they are older they are an example, a cautionary tale or a road map. If they are younger they provide a challenge, a different way to do things, a cause for reflection. My kids shared nicknames and inside jokes that conveyed both endearment and ridicule and more than once, okay more than a hundred times, my husband had to reassure me that males say terrible things to each other as a sign of affection, it did not mean that they hated each other. The cruel quips that they hurled at each other were a symbol of their love and nothing to worry about. In her recent book, Social Understanding and Social Lives: From Toddlerhood through to the Transition to School (Essays in Developmental Psychology), Dr Claire Hughes, explains that . After I finished examining my better motives for their enduring friendship I took a hard look at myself, for as Kluger pointedly says, “…reproducing is a genetically narcissistic act.” Maybe, this was just about me. My sons, husband and I, the five of us, were a period in time, a two decade long loving embrace, that in truth can never be the same again. For now there will be girlfriends and studies, later spouses, grandchildren and careers, and those magical decades will exist only in our hearts. But, If they have each other they will always have five of us together. For as long as they are bound together, in the decades when their father and I are here with them, and for the many in which we will not be, my sons can at any moment conjure up our regular Sunday night dinners, with roast chicken, carrots, onions and baked potatoes. They can be whisked back to a summer at the beach with our closest friends or the Christmas morning they saw the house across the street burn to the ground. They can remember moving houses and countries together, and the school and teachers they shared over many years. For as long as the three of them are close, all five of us are close, be it a year from now or fifty years from now. Their love for each other recreates what my husband and I created. They hold each other’s childhood and with a word or a phrase the five of us are back together again, and we are all young with so much of our lives still unknown. I told them that I wanted them to be close forever because in the end they would always have each other, because it is truly a blessing in life if there is someone who can be counted on at any time. But I now realize I was being far more selfish, because as long as they are there for each other, they will always have us.